September 17th sees the release of the first in a series of ‘how to’ books published under the imprint of ‘Transition Books’ (due soon, guides to money, working with local government and cities). 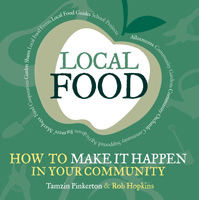 Entitled ‘Local Food: how to make it happen in your community’ it is the work mainly of Tamzin Pinkerton (who was recently interviewed here at Transition Culture) with bits from me, and it is really quite brilliant. Rather than being an intellectual exercise, it is really about the nitty gritty of setting up local food projects, drawing largely (but by no means exclusively) from the successes and failures of Transition initiatives around the world. It is packed with examples, tips, links, ideas and inspiration for rebuilding food resilience where you live. ‘Local Food’ is available from Transition Culture (and elsewhere) from September 17th, but you can preorder it now, and be among the first people to get a copy! To give you a taste, here, in full, is my introduction to the book. There will be two book launches, one in Totnes on October 1st, and another in London, to be confirmed. I’ll keep you posted. Echoes of a more resilient past. By Rob Hopkins. Not only is our entire agricultural and food system based upon the availability of cheap fossil fuels – we do not even use them in a wise and frugal manner. We squander them on flagrant consumerism in order to maximise short-term profit, while destroying the localised systems that once sustained our culture. The photo above is one of my favourites. 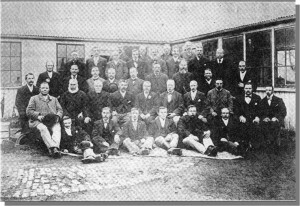 Taken in 1897, it shows the annual meeting of the Bristol and District Market Gardeners Association – thirty-seven men, in their Sunday best, posing for a formal photograph somewhere in Bristol. They sport a fantastic diversity of facial hair, and appear as smart, respectable members of the society of the time. Between them they managed many market gardens in and around the city of Bristol, creating livelihoods as well as a much more diverse and productive landscape than the one we see around us now. Today, no doubt, the sites where once they worked are host to car parks and concrete, rather than carrots and cabbages. The steady and relentless erosion of the idea that food is something that grows near where you live, by someone you have some kind of a relationship with, and that you actually cook yourself, began after the Second World War and accelerated during the 1960s and 1970s. New subsidies and international trade agreements, accompanied by the rise of the supermarket and the dazzling idea that you could now have whatever food you wanted from anywhere in the world, meant that it became, perversely, cheaper and easier to buy food grown many hundreds of miles away than food grown up the road. Farmers and growers went out of business with their land absorbed into larger farms. Orchards were grubbed out, our lives became saturated with processed foods and our waistlines started to bulge. The illusion of plenty came at a cost, as we discarded into the recycling bin of history a complex, highly skilled, adaptable and place-specific system that could be dismantled in a day but would take far, far longer to rebuild once it had gone. Food security or food vulnerability? During the 1930s, Britain’s national food self-sufficiency declined precipitously, leaving it very vulnerable by the time of the outbreak of WWII. This led to a hastily introduced effort to build food security, with a combination of the Dig for Victory campaign and a huge increase in agricultural productivity (still seen by some as the heyday of British farming). Places that hadn’t been dug or ploughed disappeared under productive use: Hampstead Heath, the flowerbeds around Buckingham Palace, and meadows and pastures were all rapidly pulled in to the national effort to avoid starvation. By the end of the war, 10 per cent of the nation’s diet was coming from allotments and back gardens, and agricultural input had increased greatly. Nutritionists argue that the nation had never been healthier. In the intervening years, national food self-sufficiency has ebbed and flowed, reaching a pinnacle in the 1980s. For a nation with such a rich history of fruit breeding, with many thousands of apple varieties suited to most soil types and climates, this is deeply perplexing, as well as troubling. If ever a country were ripe for a nationwide orchard-planting revolution, it is ours, and rediscovering the extraordinary diversity of our indigenous apples and the rich culture of songs, recipes, stories and festivals associated with them would be as much of a benefit as the rebuilding of our food security. Reacquainting ourselves with the Michaelmas Red, the Golden Noble, the Ribston Pippin, Ellison’s Orange and the Pitmaston Pineapple would root us deeper in place, in culture and in history. This erosion of our diverse, durable and resilient food system has all happened in the blink of an eye. Oral history interviews I have done in the South Hams in Devon describe how in the 1950s most houses had a vegetable garden; about a third of them kept chickens in urban back gardens; all meals were prepared using fresh ingredients; milk, fruit, meat and other foods were delivered to the home by local farmers and tradespeople; and the large majority of food consumed came from the local region – not out of some collective ethical choosing but through sheer practicality. Why import an apple from New Zealand when there are perfectly good ones growing a mile up the road? While this system wasn’t perfect, it was a system of ‘food feet’ rather than ‘food miles’, and it worked. Although few today would tolerate an abattoir on their High Street, there is much about the idea of local food culture that we need to redesign for a modern context; the benefits of so doing would be legion. Defra views any talk of food security as absurd. When it uses the word ‘resilience’ in the context of food, it is not talking about increased national production, about local markets and so on; rather it is talking about making the range of places the country sources its food from as diverse as possible. The broader the base, it argues, the less risk of any significant disruption to supply. Getting bananas from eight countries rather than four means we are less at risk. However, this attitude has started to shift. A recent Cabinet Office discussion paper on food security concluded that, in light of the challenge posed by climate change, “existing patterns of food production are not fit for a low-carbon, more resource-constrained future”.1 This book attempts to set out what ‘patterns of food that are fit for a low-carbon, more resource-constrained future’ might actually look like – and, indeed, are already looking like. Three factors are converging on our current models for how we feed ourselves, and they are converging very, very fast. The first is the issue of peak oil. In essence, oil is a finite resource, yet we continue to use it with reckless confidence, based on the assumption that we will always have it, in abundant supply and at reasonable cost. We have built infrastructure, living patterns and economic models on the understanding that we will always have access to this amazing resource, yet increasingly its uninterrupted supply is looking very vulnerable. We now consume four barrels of oil for each new one we discover, and more and more oil-producing nations are passing their peak of production. The core of the peak oil issue is the following observation: that during what we might call The Age of Cheap Oil (from 1859 to the present), our degree of economic success and sense of personal well-being and prowess has been directly linked to our level of oil consumption, yet we are rapidly moving into a time where our degree of dependence equates to our degree of vulnerability. That is as much the case in terms of our food system as it is with anything else. Secondly, the climate change issue means that the UK needs to begin driving its emissions down with an unprecedented sense of urgency. The most recent science on climate change shows that the world has reached some of the ‘tipping points’ predicted by climate scientists. Indeed, James Hansen of NASA has stated that the tipping point for the world’s climate was actually 350ppm (atmospheric concentration of carbon dioxide, by volume, in parts per million)2 – the fact that we are now at 387ppm being no reason why 350ppm should not remain the target. The important question is what the world would look like if we went to bed at the end of a day having sequestered (i.e. locked up in some way) more carbon than we emitted during that day. Some of the food strategies we will explore here are a part of that discussion. Making food and farming ‘carbon positive’ would mean that it would be at the very least organic (emissions from the use of nitrogen fertilisers are huge and are entirely unnecessary), as well as being more local, featuring more perennial crops such as productive trees, and, inevitably, employing more people. The last factor is the economic contraction the world is presently experiencing, popularly known as ‘the credit crunch’. The whole idea of perpetual growth was, if we’re honest, absurd to start with. If we gauge the success or otherwise of our economies on whether year on year we consume more, buy more stuff and spend more money, we pretty soon hit up against the reality that the world is a finite resource, that there is no such place as ‘away’. The economic recession we are going through now differs from previous recessions in that it is the first one underpinned by an energy peak. Economic growth was made possible by a model that assumed that next year we would have more productivity, more cheap energy and therefore more economic activity than this year. With the growing acknowledgement that the age of cheap energy is behind us, the concept of growth is now looking increasingly absurd. And growth has come at huge cost – social, environmental and personal. A recent study showed that the last year that increased consumption made us any happier was 1961.3 The sooner we are able to start designing for more realistic expectations of the future the better, as a more localised, diverse food system can’t be cobbled together overnight: it takes design, forethought, money and a lot of work. The Transition movement (see www.transitionnetwork.org for more information) seeks to inspire, catalyse and support community responses to peak oil and climate change. Transition initiatives are intended to be a positive and solutions-focused response to the three interlinked challenges outlined on page 13. This is a process that acts as a catalyst for communities to begin an exploration of what life beyond cheap oil might be like, and then to design how, most effectively, they might begin preparing for it. It is positive, fun and engaging. From awareness-raising and forming local food groups to creating local currencies and developing ‘Plan Bs’ for their communities, those involved in the Transition movement seek to embrace the end of the Oil Age as being a tremendous opportunity – the opportunity for a profound rethink of much that we have come to take for granted. At the time of writing there are over 180 formal Transition initiatives, and thousands at earlier stages of the process. There are Transition initiatives in the US, Japan, New Zealand, Sweden, Holland, Australia and many more besides. You will find them in towns and cities, on islands and in villages. There are now two local authorities (Somerset and Leicestershire) that have formally dedicated themselves to supporting these initiatives as they emerge. ‘Transition training’ has been set up to support these initiatives, and the training has been run around the world. There is a Transition consultancy, to work with businesses to look at how they can embed the idea of resilience in their work. Ambridge, in the fictional BBC Radio series The Archers, is a Transition Village. Ed Miliband, the Minister for Energy and Climate Change, recently told the Environment Agency conference in London that Transition initiatives were “absolutely essential”. One of the first areas that Transition initiatives explore is that of food, as it is one of the issues people are most immediately interested in, and where there are many projects that can be started relatively quickly. This book does not, for a moment, argue that Transition initiatives are all we will need. Any successful navigation of the next twenty years will require action at international, national, regional and local levels, and at that local level will require a huge range of diverse organisations, many of which are signposted in this book. This diversity of organisations is what Paul Hawken describes in Blessed Unrest as the Earth’s immune system kicking in, and this book celebrates that diversity rather than in any sense promoting Transition as a universal cure-all. Secondly, the ‘Cheerful Disclaimer’ is that no one yet knows whether Transition will work. It evolves through constant iteration: people in communities on a range of scales try out the Transition process and then their experiences feed into the ongoing revision of the model. I think of it as one of the most important social research projects underway anywhere in the world. This book is, as much as anything, an invitation to be a part of the timely, urgent and historic process of designing a positive path through the near future, particularly in relation to food, whether you choose to call it Transition or not. Given the need for an urgent and far-reaching rethink of everything we do, including how we feed ourselves, this may be an opportune moment to try to set out some kind of a vision as to what food and farming beyond the energy peak might be like. If we were to be able to taste, smell, hear and feel the UK in 2030, in relation to how it now feeds itself, what might it be like? It would, out of necessity, be more focused on local markets, a low emitter of greenhouse gases, a user of far less water, free of its dependence on artificial fertilisers and chemical pesticides, a supplier of much more than just food (building materials, medicines and energy, for example), a far greater employer of people, and supported by a complex web of local processors and retailers. The rural landscape would not look exactly as it looks now; it would be far more diverse, home to a variety of land uses, with more tree cover and with less livestock. Soil building would have become a national obsession, given the powerful role that soils play in locking up carbon and the emissions that result from their neglect. I would define the principles that will underpin this post-carbon way of feeding the country as follows. An approach that will play its full role in achieving the UK government target of an 80-per-cent cut in carbon emissions by 2050. Resilience, the ability at all levels to withstand shock, must be a key concept – embodied in the ability of the settlement in question, and its food-supply system, to adapt rapidly to rising energy costs and climate change. Improved access to nutritious and affordable food. Far more diversity than at present, in terms of species, ecosystems, produce and occupations. Prioritisation of the establishment of substantial carbon sinks through agriculture, so that farming is based more on perennial, tree-based systems, as well as good soil management and the return to soils of organic matter. More intrinsic links made to local markets than at present, with local produce being given preference wherever possible. A planned phase-out of dependence on fertilisers and other agrochemicals (ideally enabled by a shift to organic practices). A large increase in the amount of food produced from back gardens, allotments and more ‘urban’ food sources. No place for the use of genetically modified crops in what will be a more sustainable system of agriculture. All of this leads to the question ‘Can Britain feed itself?’ Incredibly, this question has rarely been asked. In 1975 Kenneth Mellanby wrote a seminal study of that title,4 which concluded that yes, the UK could still feed itself, but only if it ate a diet similar to that consumed in WWII, with the key determinant of success being the amount of meat produced. If, he argued, we ate meat like we did in 1945, i.e. a roast on Sunday, made into sandwiches on Monday, a soup on Tuesday and so on, we could still feed everyone from the UK’s productive land. Nobody asked the question again until 2008, when the editor of The Land magazine, Simon Fairlie, wrote an article by the same title – what he called ‘a back of an A4 envelope’ reappraisal of Mellanby’s original study. 5 After looking at a range of scenarios, he concluded that the UK could still feed itself, and could do so organically, if, as Mellanby had also concluded, we eat less meat. He argued that there would also be sufficient space for growing more timber for fuel and construction as well as a range of other productive uses. While more research is needed here, and while total self-sufficiency is neither desirable nor possible, it is important to establish the level of self-reliance that is possible in order to start most effectively planning for its realisation. One very useful model for how a future food system for this country might organise itself has been developed by Julie Brown of Growing Communities in Hackney, London. Growing Communities runs a number of food projects across its community, including a vegetable box scheme for over 450 people and a popular farmers’ market (see Chapter 14 for a full description of its work). Based on the Growing Communities experience, Julie has developed what may well become the template for the food systems of the future – shown in the food zones diagram opposite. The model is a series of concentric rings, from the inner city in the middle to the rest of the world on the outer edge. Julie is starting to explore how replicable her model could be, both for urban and non-urban communities. In the context of this book, it is a highly useful model. In effect, this book focuses on the first three of Julie’s rings, and on those initiatives that can be initiated by individuals and by community groups. Ultimately, this is not just about farming, but rather about a move from a nation of farmers supplying a nation of passive consumers to a nation of producer-consumers, growing some of their own food, linked with local growers in a way that once again revalues food production as an art and a skill, and which treats food production on whatever scale with the esteem it lost some thirty or so years ago. The idea of promoting local food production rather than relying unquestioningly on the globalised food system is not novel or in any way unique to this book. A rich and diverse web of allotment associations, farmers’ markets, back-garden growers, food co-ops and seed swappers exists up and down the country, forming, for many years, the firm shoulders upon which this book, and the work of the myriad organisations promoting and implementing local food systems, stand. Many excellent organisations now actively promote local food, whether through growing, procurement or promotion (see the Resources section for full details). A recent funding pot of £50 million called ‘The Local Food Fund’ has been specifically created in order to help drive this expansion forward.6 City farms can be found in most cities, and even some artists have now begun seeing edible landscaping as an art form. Boris Johnson in London has initiated a programme to get 2012 food-producing gardens in place in time for the Olympics, and Blue Peter recently dug out its garden and put in vegetable beds. Manchester City Council is planning to spend £200,000 planting fruits, nuts and vegetables in every one of the city’s parks. This book sits in that context and performs two roles. Firstly, it is a celebration of the local food culture that already exists, and the extraordinary and dedicated people who have brought it into being and nurtured it over many years. Although much of the focus of this book is on what Transition initiatives are creating and catalysing, it is also very much placed in that wider context, and you will find a great deal of signposting to other related organisations and projects, as well as ideas for further research. Secondly, this book is a handbook. It is intended to be a guide for anyone who would like to get a local food project off the ground and would like ideas and inspiration for practical projects. We hope that you will find it to be an inspiring and practical guide to get you under way in the most focused and effective way. I love my garden. Indeed, in many ways I am at my happiest in my garden. In my raised beds, built as terraces in my sloping garden, I grow carrots, beetroots, salads, spinach, chard, onions, kale, beans, peas and much more. Few things taste as good fresh from the garden as carrots and spinach. I don’t grow food because I have to. It would, after all, be easier to buy it from the supermarket. I grow food because it feels fantastic to do so – it is a magical, almost alchemical, process that allows me to know what I am feeding my family, and that lets them connect what they eat with the beds they can see while they are eating it. Similarly, the projects and initiatives set out in this book are not hair-shirt responses to impending catastrophe. They are the creation of people finding out that they share ideals and visions with each other, and that they really enjoy working together to bring these visions to fruition. These are people who discover that growing some of their food is a learnable skill, not the metaphysical art they once believed it to be. They find that their kids become enthusiastic about food for the first time, and that they feel fitter and more connected to their community and to the soil. They are the desk-bound generation, living in an economy based largely, as the comedian David Mitchell recently observed, on ‘ringtones and lattes’, who discover the joys of planting out onion sets on sunny but chilly spring mornings. This is a book about people like you, who decide that they want to take back control of what they eat. It feels to me not only possible, but inevitable, that in ten years’ time the Bristol and District Market Gardeners Association (and many others) will once again resume its annual meetings. The group will sit down together in a time when our views of the desirability of a career in growing food will have completely changed, and being an urban market gardener will be seen as a rather cool choice of occupation. These people will certainly not have quite such an extraordinary collection of facial hair, and there will be much more equal gender balance – indeed, if the proportion of people coming forward to take on allotments is anything to go by, the majority of them will be women. Their occupation will be financially viable and deeply respected. They will be working in a very different world from today. The food footprint of our cities will have contracted considerably, and people’s diets will be more seasonal. Their gardens will sit in a wider mosaic of productive back gardens, vibrant farmers’ markets, fruit- and nut-tree plantings on city streets, school grounds reconceived as small farms, Community Supported Agriculture farms on the green belt land around the cities, and any free land that can be brought into productivity used for allotments and food gardens. It is my fervent hope that this book plays a vibrant role in bringing about this new food culture in as short a time as possible. I reckon the book is gonna sell like local hot cakes! I think there will be a indcreased use of allotments, also people will be having a vegtable patch in there garden. The promo book looks good! Kevin. The book is mostly UK-focused, but the principles and the ideas have a wider application. For the rest of the world it will be useful in terms of ‘how to’ stuff and the models, just that it is illustrated by examples from the UK. Hope that helps. Thanks for doing this important work to promote local food, and for mentioning Paul Hawken’s book Blessed Unrest. To connect the global environmental, indigenous, and social justice movements, Paul founded WiserEarth http://www.wiserearth.org a free global online community. Hope to see you on WiserEarth! With thanks for the important work you do. Does the book deal with land ownership at all? There’s no mention of it here. Clearly the entire UK population can’t be fed from bits of ‘free’ land, allotments and back gardens here and there. And the huge industrial farms will need massively more people to make them productive without oil. But will many of those people be able to afford to buy land of their own as its value increases? You say agriculture will become a ‘far greater employer of people’. So most of those who end up working on the land will become agricultural labourers? Although some may choose that occupation over any other, surely it’s naive to assume that all of those who end up in this employment will be there because they would genuinely prefer to work for someone else for a wage than to work their own land. That has huge implications for our society. The last time that land ownership equated to power we effectively had a feudal society. In the peak oil world there has long been a concern that the issue of land ownership is crucial. If you ignore it, you may well end up with a new society of large land owners and a new class of basically serfs who are entirely dependent on their employers for food. Please tell me you’ve addressed the issue in the book? Surely the ownership or control of the most basic resource that we have is fundamental to who eats and how? This book sounds like another timely tool! I would like to order two – one for our Transition Donegal Library and one for myself. How can I place an order? The latter one will do the rounds of borrowers,a s well! Thank you Tamsin and Rob for all your work. Hi Judith.. you can order the book from this site, https://www.transitionculture.org/shop/local-food-how-to-make-it-happen-in-your-community/. It is all quite straightforward.. or, in Ireland, you could order it from Walnut Books. Elaine. I think that a critique of land use and land reform, and that kind of ‘bigger picture’ thinking doesn’t feature greatly in the book, as its brief was to focus on practical projects, practical initiatives that Transition groups could start today. It is not intended as a book about how the country will feed itself, that is a different subject for a different book. ‘Local Food’ focuses on initiatives that can get underway today, and on how to best maximise their likelihood of success. Of course the country won’t totally feed itself from allotments, that’s why it also looks at forging links with farmers, CSAs and so on. Elaine, you make some very good points about land ownership. The reform of land law – globally – is an absolutely critical pillar of sustainability/food security, or as you say, we will simply see the emergence of a new class of agricultural labourers or slaves. Also, I think the scale of the challenge for the world to feed itself post peak oil is often seriously underestimated, and no more so than in the modern consumer nations with their high dependency on food and fossil fuel imports, and unsustainable diets. The Growing Communities in Hackney group, which features in Local Food, has produced a chart of food zones, showing what percentage of food used by the group is grown in urban gardens, traded locally, sourced with 100 miles etc. 65 percent of the food used comes from within 100 miles, which is a hugely impressive achievement. However, only 2.5 percent of the food used by the group comes from urban gardens although presumably not for want of trying. In order to quantify these percentages more accurately, I carried out a food audit of our own garden this year and calculated our household produced about 5 percent of its total calorific intake. We also calculated that about half of the food energy yield was needed as human energy to grow the food in the first place! Still, at least there was a net food energy gain: many veg gardens would barely break even on the human energy invested. Visitors to our site (also the home of the Westport-based Sustainability Institute) frequently make comments like “You must be nearly self sufficient!” when they see the vegetables and the fruit. Unfortunately not. If we developed the site (1000m2 so 6-10 times the size of an average urban garden) according to the best principles of sustainability over the next 10 years we might get to 15 or 20 percent of our dietary needs. This type of food energy auditing is essential in order to get some handle on the nature of the challenge. Existing urban allotments and domestic gardens combined, if developed for food production in an optimal way, might eventually produce 2-2.5 percent of Britain’s calorific food requirements (I use Britain as an example as Britain is the main focus of Local Food). Currently the proportion produced is only a small fraction of 1 percent. Reaching the modest 2-2.5 percent figure quoted would require a high level of horticultural competence throughout the community: something that does not happen overnight. The oft quoted “Havana produces 90 percent of the fruit and vegetables consumed by its residents” doesn’t quite tell the whole story, which is that fruit and vegetables alone rarely provide more than a small part of dietary calorific, protein or mineral requirements. In Havana’s case, it appears total food production for the city peaked at about 500,000 tonnes. This involved the use of about 40 percent of the total land area of the city for growing food – a proportion not easy to replicate in many UK cities. The actual proportion of Havana’s total food requirements met by food production from within the city during the ‘special period’ was probably between 20 and 30 percent. The link below is to a detailed 55 page study of food production in Havana (“Cultivating Havana: Urban Agriculture and Food Security in the Years of Crisis”) carried out by Catherine Murphy. Havana had a very big incentive to grow food – its people were starving. In spite of that, it still took 7-8 years from the onset of the crisis to get production up to the levels quoted. I found this article interesting and looking forward to getting the book. Here in Murwillumbah Northern NSW Australia we are in the beginning period of developing a Transition Town movement and I am personally trying to start a Community Garden . It all takes time. It would be good to have a book like this more relevant to Australian conditions. We could be completely self sufficient in Australia as we have a climatic zone that stretches from the Temperate to the Tropical. Water can be a problem but would not affect home and community gardens. All the best David. If food reestablishes itself as a fundamental necessity for existance then the people who are involved in its production will benifit from a greatly increased respect from the population they feed. this should translate to possibly higher wages and a desire for people to want to be actively involved in this type of work. Yes indeed Nigel, attitudes towards people engaged in food production do need to change. Just consider how many people currently work in near-slavery around the world in order that the people of the rich nations may enjoy imported food goods. What respect do these exploited agricultural labourers get, if any? I fear it would be no different in a post-peak-oil world (except those toiling the land might be nearer to home) unless there is accompanying social and economic reform. I don’t see it as an issue about respect in itself. In the feudal system, it was understood by all layers of the system that it rested on the serfs. There was a whole religious idea which backed up the respect that the serfs had to be given because of the importance of their work. That didn’t translate into them having control over their working conditions or standard of living. Those things, which are surely as important as being given ‘respect’ varied throughout most of history based on how many labourers were available relative to how many were needed. The relative importance of one’s work now doesn’t translate into higher wages. Hospital cleaners earn a fraction of what hedge fund owners do and there’s not much argument about which one provides a more fundamental service to us all. The idea that people will become agricultural workers because they want to is looking at it from the perspective of our current society, where no one is (in theory…) forced to take work just to put food on the table. In the absence of a welfare state safety net the nature of the choices available to people will change. What I am talking about is changes in the structure of power in society. Concepts like respect and perception need to be understood in that context. People need to have a certain amount of control over their lives and working conditions to be happy. Being given respect by the rest of society, while it might be very important, doesn’t translate into having that kind of freedom or control, which are also important. In a post peak oil world, it’s likely that landowners will become wealthier and more powerful, since they will have control of a resource that more and more of us need access to. They won’t need to be overly concerned about the respect they’re given.